The Xerox 5300 series are capable of producing tabloid copies at high speeds. The 110 duplex document feeders allows you to do more jobs, more quickly. Built with modern offices in mind, the 5300 series comes with a standard, large color touchscreen to make jobs easier and allow you to troubleshoot with ease. It offers the comfort of knowing you have trusted Xerox technology in a number of affordable options. So what copiers are part of the WorkCentre 5300 series? All three options are similar, with the higher numbers offering more power, more size, and more speed. 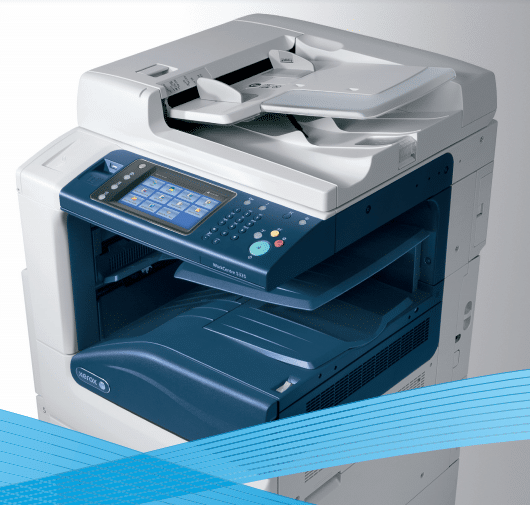 The WorkCentre 5325 beings at around $6,100 and offers print speeds of around 25 pages per minute. It beings jobs without a hitch and produces the first print in as little as 4.2 seconds. It can handle a monthly duty cycle of around 100,000 images while offering a maximum print resolution of 600 x 600 dpi. The WorkCentre 5300 series comes with a huge hard drive of at least 160 GB to comfortably hold all the files you need. And you can be sure that those files will be protected with standard 256-bit hard drive encryption. The WorkCentre 5330 and 5335 copiers offer more power and more speed than the WorkCentre 5325. The 5330 comes at a price of around $7,100 and can print at a speed of up to 30 pages per minute with a duty cycle of 125,000 images. The WorkCentre 5335 offers even more power and can print at speeds of 35 pages per minute with a duty cycle of 150,000 images a month, with a list price of $8,100. If you want to get one of the WorkCentre 5300 series copies in your office today then give us a call at Denver Copier. We have the best deals on copier leases in Denver and are enthusiastic to get you set up with the perfect copier today.